Atlas Shrugged Part 2 opens on Friday, October 12, 2012 across the U.S. Movie times for Atlas Shrugged Part 2 in a theatre near you can be found here. Based on Ayn Rand’s (Feb. 2 1905 - Mar. 6 1982) 1957 novel, ATLAS SHRUGGED PART II is set in a near future dystopian USA with a global economy on the brink of collapse - unemployment at 24% and gas at $42 per gallon - and brilliant creators, from artists to industrialists, continuing to mysteriously disappear at the hands of the unknown. “With the recent nomination of Paul Ryan, Ayn Rand’s name has been more and more in the spotlight recently. We’re very happy to see Ayn Rand’s ideas finally making their way to the mainstream.” commented Harmon Kaslow, Producer of Atlas Shrugged Part II. Republican Vice Presidential nominee Paul Ryan is well known to be an Ayn Rand fan. 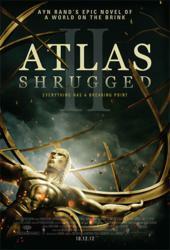 “For those that have read the book, while Atlas Shrugged Part II the movie may not be the movie that’s been playing in everyone’s head since closing the back cover, it is without question a celebration of Ayn Rand’s ideas - and that’s what has everyone most excited.” continued Kaslow.